And so we get one step closer to finishing the update of the 1985 figures. Of course, since this guy was only available with the king of toys, it's not like many of us ever had him (well, unless you played a lot of skeeball at Chuck E. Cheese in the mid-90s, where he was, for some reason, commonly available as a prize). As a young sailor, Keel-Haul graduated from the Annapolis and Navy Flight School, and cut his chops flying Phantom F-4s off the USS Intrepid aircraft carrier. In the service, he earned the Navy Cross, Distinguished Flying Cross, and Air Medal. His career trajectory then took him to Navy War College and Armed Forces Staff College. His years of leadership training and fearlessness under fire made him the perfect choice to lead the GI Joe naval forces as both a respected commander and capable pilot. He is a renowned military historian, a nationally rated chess player, and seems to have access to the world's best gourmet coffee. Keel-Haul perfected the art of take-offs and landings on aircraft carriers, even at night, so he knew it was his destiny to serve on the USS Flagg (CVN-99). this nuclear super carrier is named for the late Brigadier General Lawrence J. Flagg, who was instrumental in the formation of the GI Joe team (even suggesting their name). The carrier now serves as the sea-based headquarters during all nautical missions. Keel-Haul is another FSS 2.0 figure lucky enough to get a head sculpted by Boss Fight Studios. The old toy wore his hat at a rakish angle, but since Tollbooth already had that covered, Keel-Haul's cover is on level, just twisted slightly to the side. The "scrambled eggs" oak leaves on the brim and the crossed-achors insignia in the center are fully sculpted, not just painted. Everything else is reused. The torso is Shipwreck's, while the limbs and jacket are from the Rise of Cobra Hawk that you could only get if you bought the giant Pit playset that nobody wanted - so those might as well be new. This is a really great way to update Keel-Haul to the Generation 3 style, keeping his classic look intact but raising it to modern standards. 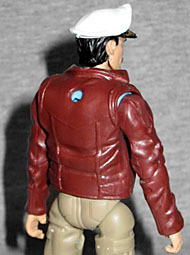 The torso may be a bit larger than the jacket was intended to fit over, because the backpack holes don't line up at all, and you can see his shirt through the gaps at the back of the shoulders. The legs are also almost comically skinny - they're barely larger than Cover Girl's legs! The arms are fine, but a different pair of legs should really have been chosen. Almost anything would have been better. Two things about the paint could also have been improved: more service bars on his chest, and a unit patch painted on his right shoulder. The "fruit salad" pins are just painted on, so they really could have done any number at all, while the patch on his arm was in fact absent from some vintage samples - it was a common error - but that's no excuse not to include it here. But hey, maybe that part of the paint budget went to all the details on his hat, in which case, "good"; that part looks terrific. Hawk was released before the Joes' articulation got really, really good, so Keel-Haul doesn't have swivel/hinge wrists or rocker ankles. The rest of him, though, meets the standard you'd expect. The up-down motion of his head isn't as far as we might like, and the hips are stiff, but the joints are there and they function the way they should. 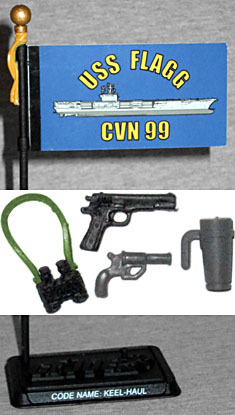 Keel-Haul comes with some nice accessories, but no, not a scale model of the USS Flagg. How awesome would that have been? He does have the Flagg's flag, though - a dark blue banner with big yellow letters and the starboard elevation of the ship. The mast is the same mold Duke came with, as is his display stand (so the flag pole can plug into it). He also comes with a pistol from Hawk, a flare gun from Doc, and a green and black pair of bi-nocs. Weirdly, he's also got a grey travel mug, which must be why the filecard mentioned coffee (the original instead said he was the world's worst clarinet player). It came with the same Pit playset as the jacket and limbs, and apparently fits in the cup holder in the VAMP Mk. II (I never managed to find either release of that one, so I can't say for sure). 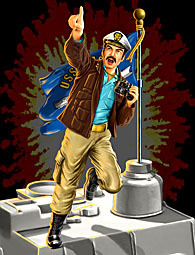 The original figure's filecard art somehow managed to make Keel-Haul look like Bruce Campbell, before Bruce Campbell was even a thing. Well, okay, Evil Dead came out in 1981, so it's possible the art was based on him, but he looked like an older, mature Bruce Campbell. Like, Brisco County/Xena-era Bruce Campbell. Anyway, he was just sort of standing there, while the new version, by Adam Riches, is much more dynamic. Unlike almost every other piece of Joe art ever, Keel-Haul isn't floating in an explosive void; there's a bit of ship painted beneath his feet, placing him firmly on the Flagg we're never going to get. He's running forward, and pulling his binoculars down as he shouts a command and points to the sky. Maybe he's just spotted a squadron of incoming Rattlers and is calling for the guns to be traversed to blow them out of the sky. Keel-Haul is the most senior member of the GI Joe team - he's an admiral, for crying out loud! (The filecard lists him as a 3-Star Vice-Admiral, grade O-9; Hawk was Grade 0-6 when he was introduced in 1982, but became a Brigadier General [Grade 0-7] when he was updated in 1986 - so, two ranks lower than Keel-Haul). This is a good update, kept from being a great update by his weird "Jake Sully" legs. He's an excellent choice for release as a Collectors' Club exclusive - recognizable to fans, but a bit too... "plain" for a mass release. He's a guy in khakis and a leather jacket; he looks like your uncle taking his daughters to an early morning soccer game. And short of actually releasing a modern USS Flagg (which, let's be entirely honest here, is really not that good of a toy), was there any place Keel-Haul would have fit in as a normal release?